It's summer time and if you're anything like us, you have the occasional gathering which results in a bit of a mess to clean up afterwards. I often spend an hour or more disposing of half empty bottles of soda, water and beer. What a waste! I save the water bottles to use on the plants but did you know that you can also use beer in the garden? Stale beer has yeast, proteins, sugars and other beneficial nutrients like potassium, calcium, magnesium, phosphorus and more. Beer also has carbohydrates which feed the microbes in the soil, who in turn feed the plants. Plus after sitting out overnight the alcohol has evaporated. (Alcohol can harm plants so if you happen to have skunky beer you want to use up, just open it and let it sit for a day or two before using it.) 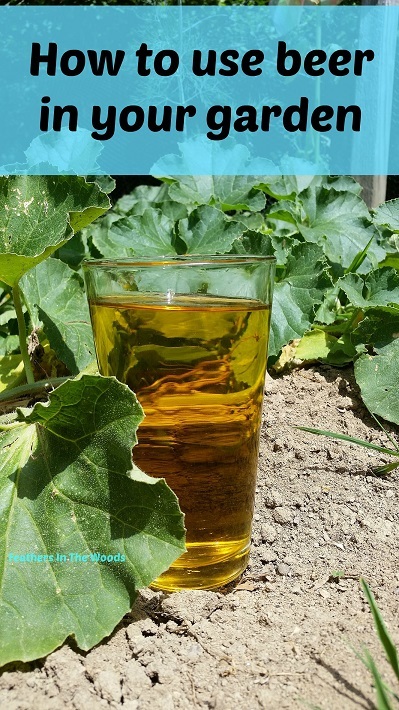 I've composed a list of 7 ways you can use beer in and around your garden to benefit plants and attract insects. Watered down beer will add nutrients and nitrogen to the soil to give your plants a boost. Give your compost a jump start by dumping beer on it. The yeast and sugar in the beer feed the beneficial bacteria in compost to really get it cooking. Add some stale beer to your wasp trap to keep these stinging brats away from you while gardening. Here are directions from Instructables to make your own wasp trap from an empty soda bottle. Dig a shallow hole in the dirt and set a pie tin or similar shaped plate in the ground. Fill with beer. The fermenting yeast smell will attract the slugs which will crawl in and drown. You can use fresh beer for this one if you happen to have some on hand that you don't like. Carbonation in beer can help remove rust from your garden tools. You'll need a fresh beer for this one too, but simply soak them for about 10 minutes then buff with a cloth. Slice an overly ripe banana into a shallow dish. Drizzle with blackstrap molasses and add beer almost to the top of the banana slices. Hang from a tree. Add a few tablespoons of stale beer to a quart of water once a month. Water houseplants as usual. Place a cup of beer on the kitchen counter. Cover with plastic wrap and secure with a rubber band. Make holes in the top with a toothpick. Fruit flies will crawl through the holes to get to the beer but get stuck inside and drown. If you happen to have any more stale beer left, you can water those brown patches in your lawn with it. The acids will help kill off the fungi that causes some brown spots, plus the fermented sugars will feed the new grass. You might want to make sure the neighbors aren't out first. You'll look mighty funny trying to get your lawn drunk! Great tips. I will have to give them a try!! I had no idea it was good for so many things in the garden. Thank you for stopping by The Maple Hill Hop! The butterfly attractant cracks me up. I know the alcohol is gone, but I'm just picturing little drunk butterflies flying around. :) Great list, I didn't know about most of these. I love finding new ways to eliminate waste. Even without a party, I can't tell you how many half empty bottles of beer I've found sitting around the next morning. lol...drunk butterflies would be pretty funny! Thanks for choosing my post! I'll head over and check it out now! I never knew that beer had so many uses in the garden. Very useful information and I will have to try some of these. Visiting from Homestead Blog Hop. great tips! thanks for nice ideas!